Great art is timeless, and corresponds to all beholders, no matter how young. This is what executive producer Josh Wakely discovered one day while listening to The Beatles on the radio after his first child was born. As he told Rolling Stone: “I remember hearing ‘All You Need Is Love’ in the car and realizing that it was a perfect song melodically. It had a message of love that resonated with me as a young parent, that it’s a message you can teach children.” The result was Netflix’s “Beat Bugs,” which premiered earlier this month. All episodes are currently available. Like Wakely, I often ask myself what it is that I would like to pass on to my children? Of course, my Catholic faith is at the very top of the list. But because beauty is a link to the Divine, coming a close second is an appreciation for the arts, all arts, but most especially great music. “Beat Bugs” imparts a piece of music history to the next generation in a very unique and literal way – and despite what you might think, the songs apply to kids’ life lessons very easily – because of its greatness, and childlike simplicity. Not everyone might consider The Beatles to be deep-thinking philosophers, but along with their catchy rhythms and soulful melodies, their lyrics often strike a very human chord. That is to say, although simple, the language that floats atop their sonorous music speaks real truth to the human heart. If you break it down, the examples really are abundant. For example, who among us has never felt the need for help, sometimes desperately so? And so, The Beatles song “Help” more than mere practical help. This song speaks with great intensity to the difficulty of our fallen human situation; it seems to cry out of our real need for God and one another’s help to progress through the journey of life. It captures so well, the sometimes-haunting loneliness of just being an individual and trying to navigate the paths of life in one’s own strength. 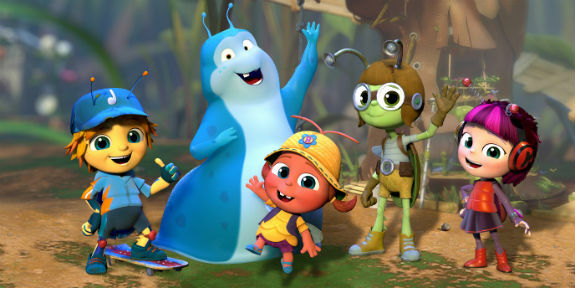 Now let’s translate this idea for the kids: In “Beat Bugs” episode one, where Jay, the reckless and stubborn beetle, is forced to cry out for help because he is stuck in a jelly jar, he learns that friendships can grow stronger because of our weakness. The message corresponds to even the smallest child. Beatles fans might laugh, knowing the overly poetic, almost nonsensical lyrics some of these songs contain. But since the songs are great art it corresponds quite easily – with the help of some very literal references to the lyrics. In “Lucy in the Sky with Diamonds?” for instance, Lucy the dragonfly (that actually has kaleidoscope eyes) teaches Buzz the little bee to use her imagination to fight her nightmares. In “I Am the Walrus”, Walter Walrus, the slug, learns self-confidence after making an embarrassing first impression on his new bug friends when an egg falls on his head. A grasshopper offers an unpredictable “Magical Mystery Tour” to the five bug friends, and the list goes on. Great art attracts the great, is it any wonder that many stars of today are attached to this series, such as P!nk (“Lucy in the Sky with Diamonds”), Sia (“Blackbird”), Eddie Vedder (“Magical Mystery Tour”), James Corden (“I’m a Loser”), Aloe Blacc (“Rain”), and many more. Already “Beat Bugs” have the green light for a second season, to air in November. Great art also unites us in the common human experience, especially music, as was witnessed on our evening family walk, after watching “Beat Bugs”. We were all singing the familiar tunes, which even my three-year-old boy learned. As the beautiful melodies echoed through the neighborhood, I realized that there were three generations being unified, and I was so proud of my kids for knowing some of timeless favorites, I couldn’t help but sing along.